Cricket cell phones are meant to dispel the common misconception that mobile phones are complicated devices only meant for tech-savvy. Cricket Communications (official company website) takes pride in simplifying the process, offering not the most complex handsets on the market, but ones that actually work and work well. Cricket Communications describe itself as "a simple and affordable wireless solution" wherein "home phones and mobile phones can be the same phone." No need to worry about counting your minutes and seconds, because Cricket cell phones offer unlimited airtime. There's no messy contracts, no hassles, and you can personalize your services to your needs, including caller ID, ringtones, text messaging, and call waiting. 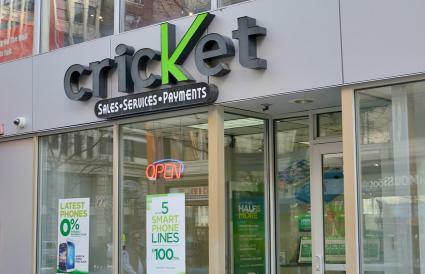 Officially, Cricket is a subsidiary of Leap Wireless International. They operate on a CDMA-based network that is completely digital. Their service does not cover the entire United States, currently only working in 41 markets in 20 states. These markets include: Fresno, Salem, Phoenix, Reno, Boise, San Antonio, Tulsa, Denver, Kansas City, Charlotte, Memphis, Pittsburgh, and Buffalo. The majority of Cricket cell phones come from the lesser-known Kyocera. Sure, they may not be as well known as the latest multi-megapixel Nokia or a fashionably sleek Samsung, but they could be quite the viable option in their own right. If you want to be unique and stand out from the crowd, a Kyocera from Cricket Communications may not be a bad bet. The following list was accurate at the time this article was posted. Check with your local dealer to confirm their availability. Kyocera KX9e: This simple flip phone tackles the low-end of the market with its very affordable price point. As you'd probably suspect, its feature set won't exactly wow you: there's no external display, no camera, or anything like that. Instead, you get an internal 65k color display, speakerphone, and text messaging capabilities (with predictive text). Kyocera Dorado: The only candybar-styled handset in Cricket's lineup, the Dorado features a front ported speakerphone, 32-chord polyphonic ringtones, and is Enhanced messaging Service (EMS) capable. Kyocera Slider Remix: As its name implies, this is a slider phone with MP3 playing tendencies. Memory can be expanded via removable TransFlash cards, providing extra space for your music and pictures, the latter of which you can take yourself with the integrated 1.3 megapixel camera, complete with flash and digital zoom. Motorola RAZR V3c: If you must be fashionable, slim, and chic, you can't really go wrong with the RAZR. It is ultra-thin, of course, but comes loaded with advanced speech recognition, 1.3 megapixel camera with video, Bluetooth Technology, and 30MB of internal memory. Available in Charcoal only. This cell phone plan information is meant to be a guide only. Please confirm with the official Cricket website or with a local authorized dealer before making any purchasing decisions. Cricket Communications offers three main plans to their subscribers. If you pick up a Cricket cell phone, you will know right away that you won't have to worry about counting your minutes, because even the most basic of their basic plans comes with unlimited anytime minutes. Unlimited Classic: For $35 a month, you get unlimited anytime minutes within your chosen service area. No bells, no whistles, just a whole lot of talk time. Unlimited Plus: For $40 a month, you get the same unlimited local airtime as the Classic cell plan, but with one very substantial addition: unlimited U.S. long distance. If you're in California and need to reach your cousin in Oklahoma, it won't cost you an extra penny whatsoever. Unlimited Access: For $45 a month, you receive the full meal deal. Like the two above plans, you are treated to unlimited local airtime, as well as unlimited U.S. long distance. The bonus features here that set it apart from the Plus plan are unlimited text, picture, and instant messaging. Moreover, you get voice mail, caller ID, and call waiting. If you want the best and will settle for nothing less, this plan is for you. If you find yourself calling Canada or Mexico fairly often, for business or otherwise, you may want to consider the $15 upgrade that provides you with 300 international long distance minutes.